Some neighborhood leaders said people do not use the current crosswalk on H Street that leads to a Marvin Center entrance. The Foggy Bottom and West End Advisory Neighborhood Commission passed a resolution to create a new sidewalk on the block. The Foggy Bottom and West End Advisory Neighborhood Commission unanimously passed a resolution Wednesday proposing to create a new crosswalk on H Street between 21st and 22nd streets. 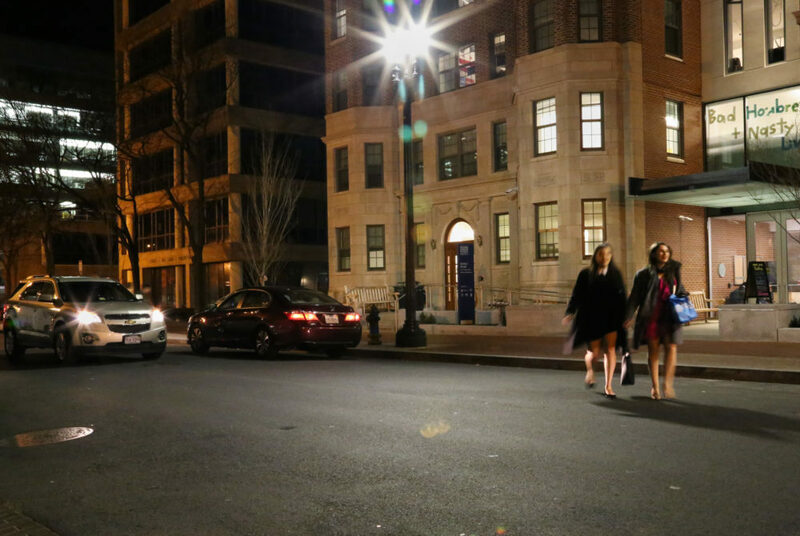 The ANC will write the D.C. Department of Transportation to suggest it work with GW on the new crosswalk between the Academic Center and Kogan Plaza. Some ANC commissioners said people do not use the current crosswalk that leads to a Marvin Center entrance and instead cross the road in the middle of the block – putting both pedestrians and drivers at risk. Eve Zhurbinskiy, ANC commissioner and a junior, said she proposed the resolution because the current Marvin Center crosswalk is not compliant with the Americans with Disabilities Act: There are no curb cuts, making it inaccessible to those in wheelchairs. “I think that we should have a sidewalk that people can use that reflects actual pedestrian pathways, and that everyone, regardless of whether they’re able or disabled, can use the crosswalk,” she said. Zhurbinskiy said the new crosswalk would improve safety for vehicular traffic because now, cars have to stop and go depending on when people cross. The University proposed to revamp the H Street crosswalk in 2006 as part of the campus plan, three years after a student was struck by a car while crossing the street in the middle of the block. A car also hit a pedestrian who walked out in between parked cars along H Street in 2011. Patrick Kennedy, the ANC chairman, said people jaywalk to get to the heavily trafficked buildings on both sides – the Marvin Center, the Academic Center and District House are on one side of the street and Gelman Library is on the other. “It’s existing safety hazard for pedestrians, and I think on that basis, we want to address it and make it safer for both pedestrians and drivers,” he said. Kennedy said because cars are parked on both sides of the street, jaywalking is especially dangerous. “Particularly food trucks reduce visibility for drivers, and some folks who cross the street are not always paying the most attention to their surroundings,” he said. Detrick Campbell, another ANC commissioner and a junior, said at the ANC meeting that the original mid-block crosswalk should not be removed because it gives people a chance to be visible in two locations when crossing. He added that it might be hard for traffic to get through if only the new crosswalk is installed. “I’ve seen GW cars constantly stuck in there for about 20 minutes before they are able to do anything, so I think having both of them would be a better idea, and having it close to that exit to Gelman,” he said. University spokesman Brett Zongker said in an email that GW supports the decision to add a mid-block crosswalk, but that it must be wider than a standard crosswalk and have special features that would call attention to drivers while urging pedestrians to use the crosswalk. The University would not support a solution that would not have these features, he said. “GW is hesitant to support implementation of a crosswalk solution that we are not confident will be effective in this location,” he said. Leaders of the Residence Hall Association and the Student Association also plan to propose a separate resolution to the SA Senate to develop the crosswalk. The student leaders have worked on the proposal with John Ralls, the special adviser for communications and outreach in the Division of Operations, since last spring, they said. Cole Ettingoff, the SA Director of Operations, said while the H Street corridor has always been a safety concern, it is even more noticeable now because of District House’s H Street entrance. He added that with all of the groups, including the ANC, the D.C. Department of Transportation, RHA and the SA, working together to push for the crosswalk, it is more likely that it will be added. “The last thing we want to see is one of our students get hit by a car there,” he said. RHA President Ali Belinkie said she sees safety issues with the crosswalk every day when she walks to class and wants to encourage people to cross at the new crosswalk when it is installed. “I’ve seen multiple cases where a car has to quickly stop and honk or a student has to jump out of the way,” she said. The school would not be charged for adding the crosswalk, Belinkie added.